In this challenging book, first published in 1987, Michelene Wandor looks at the best-known plays in the thirty years prior to publication, from Look Back in Anger onwards. 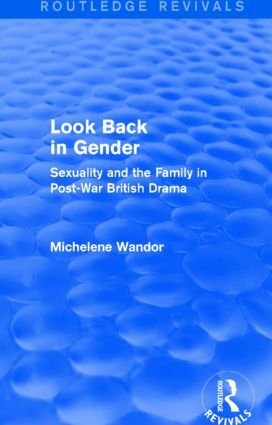 Wandor investigates the representation of the family and different forms of sexuality in these plays and re-reviews them from a perspective that throws into sharp relief the function of gender as an important determinant of plot, setting and the portrayal of character. Juxtaposing the period before 1968, when statutory censorship was still in force, with the years following its abolition, Wandor scrutinises the key plays of, among others, Osborne, Pinter, Wesker, Arden, and Delaney. Each one is analysed in terms of its social context: the influence of World War II, the testing of gender roles, the development of the Welfare State and changes in family patterns, and the impact of feminist, Left-wing and gay politics. Throughout the period, two generations of playwrights and theatregoers transformed the theatre into a forum in which they could articulate and explore the interaction of their interpersonal relationships with the wider political sphere. These changes are explored in this title, which will allow readers to re-evaluate their view of post-war British drama.